Classical studies with Paul Kantor, David Perry, and Andrzej Grabiec. 1998 Rocky Mountain Fiddle Champion. Performances across the United States and Europe. Regular televised appearances on the Grand Ole Opry, PBS, CMT, and GAC. Performed and recorded with John Hartford, Marty Stuart, Jimmy Martin, Mike Snider, Kenny Baker and Josh Graves. Live appearances with Vassar Clements, Ricky Skaggs, Charlie Pride, Ralph Stanley, Curly Seckler, Mike Marshall, Earl Scruggs, and Dierks Bentley. Featured performer at Bellingham Festival of Music, Chamber Music at the Barn, Wichita State University, and The New England Conservatory. 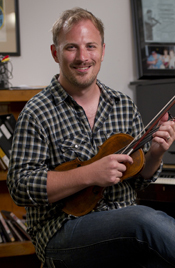 As an educator, workshops at Mark O'Connor's Fiddle Camp, Blair's International Fiddle School, Chamber Music at the Barn Acoustic Workshop, and Wichita State University. Recorded on Grammy-winning soundtrack for PBS' Rachael and Andrew. Arrangements for Roy "Futureman" Wooten, Wichita State University's Percussion Ensemble, and David Grisman's Mandolin Symposium. Currently co-producing with Sub-ID on a multi-genre solo album. Blair School since 2004.